Enjoy a full day at leisure in the City of Manchester. 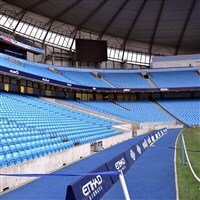 This afternoon you may wish to join our guided tour of the Etihad Stadium, home to Manchester City Football Club. Go behind the scenes and access areas normally reserved for players and managers, like the tunnel, the dugouts, the changing rooms, conference room and The Tunnel Club plus much more!